Fire & Light Glassware... dinnerware collection includes several different sized glassware bowls. 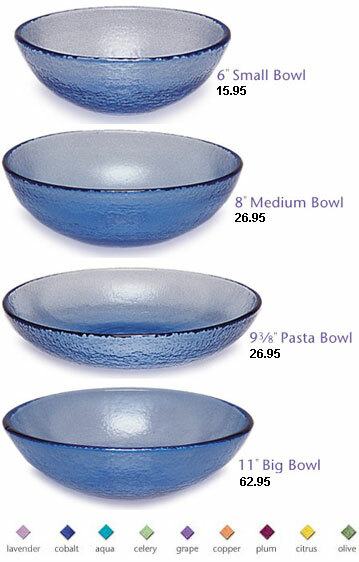 Fire & Light glassware bowls are sized 6" small bowl, 8" medium bowl, 9 3/8" pasta bowl, & 11" big bowl. Select the color & size bowls that you wish to order from the ordering drop down provided. Fire & Light hand poured glassware has been created for both form & functionality & is known both for its vibrant color & texture. Preserving the rich tradition of American hand pressed glass & utilizing a once wasted resource, glass... there is nothing else like it! "As a country, the U.S. throws out enough glass to fill the Empire State Building every day. As a company, Fire & Light turns some of this trash into Treasures." Fire & Light Recycled glassware bowls.